​As soon as I arrive in Paris I always pop straight out for a short walk beside the riverbanks of the Seine. Paris is such a fun city to experience by foot. Taxis, it’s true, are reasonably priced and come with all the renown ‘hauteur’ (disdain) of the driver. The ‘Metro’ underground certainly has all the character of the city’s underbelly and cycling is now well catered for in the central expanses. But to stroll beside the Seine has a pace of its own. I was staying nearby at the stylish Le Saint Hotel in the Saint-Germain district. It’s blissfully silent and very well-kept. Real ‘townhouse chic’! I visited the beautiful Sainte Chapelle on the Île de la Cité. It looks amazing as the sun streams through the stained-glass windows. Behind it and the stern of the island, is the Place Dauphine, unknown to tourists, and a perfect triangular spot for my picnic of crispy bread and pungent cheese. A real find! My first night was spent at the hotel’s ‘Kult restaurant’ which has a refreshingly short and confident menu and it was just great to enjoy its snug atmosphere after all the travelling. It was here that I learnt about how the French combine their cheeses with Sainte-Maure de Touraine for goat’s cheese, St. Nectaire as the semisoft, washed rind cheese and the Camembert au Calvados as the utterly delicious softer variety. ​Staying in this Saint-Germain ‘arrondissement’ (district) has long been a favourite of mine. It has its own distinctive, luxuriant vibe with clothes, scent, chocolate and cake boutiques. The doors and gateways are often harmoniously colourful with jade green celadon a favourite. So on I went past Frederic Malle’s first scent salon, a veritable boudoir complete with smelling vacuums, then into a Maison Pradier cafe, offering freshly made eclairs. I visited many of Paris's lesser known museums and they are relatively unknown to tourists: the painter Delacroix's house in Saint Germain is very intimate, whilst the Jacquemart-Andre on Boulevard Haussmann exemplifies the glory of French interior decoration in the 19th century. The Marmottan on Rue Louis Boilly, alongside the Bois de Boulogne has many special Impressionist works including Monet's “Sunrise: An Impression” from which the movement derived its name. I ate that night at Georgette on the Rue d’Assas. It’s right by the Jardin du Luxembourg and has ample ambience with all the characters amongst the local clientele, consisting of birthday groups and romantic couples. It’s a friendly welcoming place with simple décor and delicious, honest food. Great for watching the Parisians at play. ​The next morning I took a trip up the Avenue des Champs-Élysées. Haussmann, the renown town planner, paid great attention to straight lines leading upto public monuments at focal points. I followed the brilliant straight line that starts from the centre of the Louvre, goes past the Roue de Paris, which is the tricolour Ferris wheel, and through the Tuileries Gardens onto the wonderful expanse of the Place de la Concorde with its romantically cobbled paving stones and green and gold lanterns, on past the truly triumphant Arc de Triomphe, the circus of all roundabouts, to the modern arch lying in the financial district that is La Défense. Some sixteen miles or so! 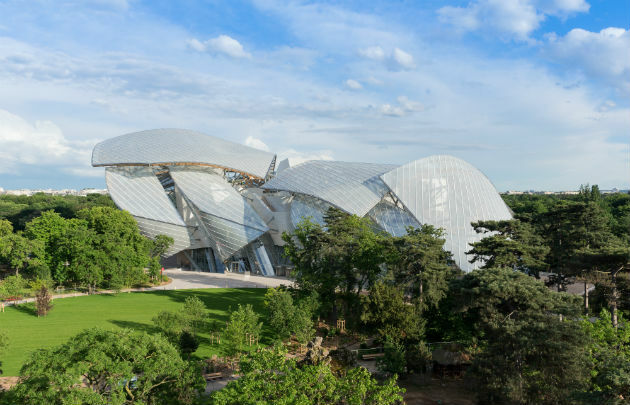 I visited the Louis Vuitton Foundation, an art exhibition space in the Bois de Boulogne, the city’s central wooded park. Having given up on getting in, I looked online to discover that if you go via the children’s theme park you can join a much shorter queue (thank you Trip Advisor!). In I got and what a joyous structure the Foundation is with a broad fountain of cascading waves in front and strong coloured roofs above. 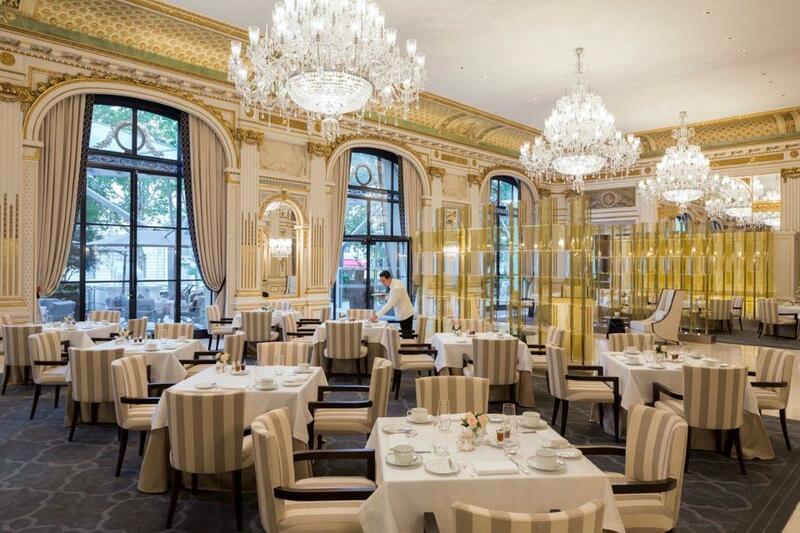 ​My final wonderful meal was at Le Lobby in the Peninsula Hotel on Avenue Kléber (off the Arc de Triomphe). It’s confident, stylish, classy, lavish and splendid. The dining experience is set in a hall bedecked with chandeliers and the frescoed ceiling reigns over the luxuriant tropical plants. Definitely somewhere for that very special occasion or for those seeking a very luxurious experience. Here I enjoyed ‘le poireau cuit en papillote’, a hollowed leek filled with ginger-scented king crab, wakame and sesame seeds, alongside an amazingly presented salad of lettuce, shaved vegetables including daikon radish, with mango and mango dressing. All followed by a beef fillet with agria potatoes, cadoret oyster and gravy. For dessert, I indulged in ‘l’emotion chocolat’, a grand crus chocolate and macadamia nuts with Macaé ice-cream. On the hour, I popped upstairs to the roof terrace to watch the Eiffel Tower glitter and dazzle as it does for several minutes hourly at night. ​Adam travelled with Classic Collection Holidays (0800 294 9323; classic-collection.co.uk) which offers 3 nights at Le Saint Hotel, Paris from £770 per person in May. Price based on 2 adults sharing a classic room on a bed & breakfast basis, and includes return flights from London Gatwick (other UK departure airports available) to Paris and private transfers.